This high concept is engineered for maximum speed and efficiency. The gang of snails in a typical garden have that one rebel named Turbo, who wants to be the fastest slow creature of them all. The scenario is taken to the nth degree, amongst a interesting visual universe, and a large ensemble of familiar celebrity voices. This is the moral of no matter what circumstance you’re born into, you can overcome the obstacles. This plays out both with Turbo, his snail community and his working class human pals. Everybody goes to the Indianapolis Speedway to find out how a snail will set them free. Either that or it makes a nice incentive to buy that stuffed Turbo for Christmas. Turbo the snail (voice of Ryan Reynolds) is a self determined speed freak. He is constantly watching race footage of his driver hero Guy Gagné (Bill Hader). 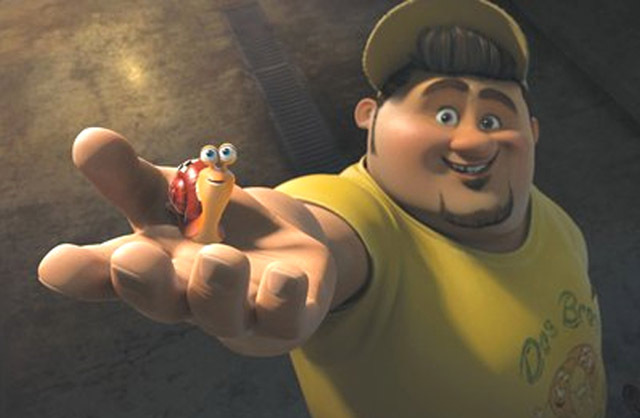 Turbo’s brother Chet (Paul Giamatti) is worried about his sibling’s obsession, and tries to keep it from the rest of the snail community. Fate intervenes when Turbo sits above a highway, watching cars speed by. The snail is thrown into the air and is sucked into the engine of a drag racer. His DNA fuses with the nitrous oxide in the engine, and his whole body is changed. Turbo has gained super speed, along with other vehicle characteristics like eyes that glow like headlights. This gets him involved first in snail races, which are facilitated by a taco stand dreamer named Tito (Michael Peña). When Tito discovers this super speeder, he’s taking him all the way to the Indianapolis 500. Submitted by Tames5 on November 28, 2014 - 12:30pm. Always June, botte Uggs pas cher Espousing they classic components www.giannenainfo.gr/giannenalinks/ugg.html , http://www.switchmag.fr/presse/ Holds for being a mention of individual some of the most important Destroyer.